Maurizio Lazzarato is perhaps best known to Anglophone readers due to two key vectors of his work: (i) on immaterial labour (1996), which focuses on the importance of cultural and informational production, as well as affective labour, in contemporary capitalism; and (ii) on debt, which situates the creditor-debtor distinction as a fundamental, asymmetric, and inexpiable power relation upon which the machines of capital accumulation are oiled today (2012; 2015). The original material translated in Experimental Politics (EP) falls temporally between these two aspects of Lazzarato’s work, the research and publication of which was done in the context of and subsequent to an industrial dispute in 2003 sparked by austere and restrictive reforms being conducted by the French government, initially justified in terms of a large deficit, on an existing system of unemployment insurance in the creative industries. Within the dispute, the intermittents du spectacle (“intermittent” workers in the creative industries included in this system of unemployment insurance) politically emerged and engaged in, for Lazzarato, creative and experimental forms of politics which are instructive examples of the new kinds of techniques of resistance and solidarity for confronting contemporary capitalism. Lazzarato, as Jeremy Gilbert notes in the Introduction, was directly involved in some of the coordinations, ‘as both a sympathetic activist and sociological researcher’ (xiii). This theme of the micro- and macro-political work of the coordinations of intermittents is the first key thread of EP. The second is the conceptual framework through which this and other struggles in contemporary capitalism are filtered. This framework blends Deleuze, Guattari and Foucault, as well as the Italian autonomist tradition. Much of EP is conducted as a politically and empirically engaged conceptual analysis with the coordinations of intermittents deployed as a primary case study. Operating at the intersection of philosophy and sociology, Lazzarato’s analysis operates transversally between the conceptual and the empirical; and those who read his more recent Signs and Machines (2014) will find here much of the ideas developed there in comparative germination. The book itself is divided into three chapters. The first, “The Government of Inequalities: Critique of Neoliberal Insecurity,” seeks to contextualise the struggle of the intermittents as having general implications on two fronts: (i) the mutating forms of increasingly precarious work and unemployment under neoliberalism, and (ii) what a politics that confronts these new conditions might look like (3). This is developed primarily through a Foucauldian reading of techniques of neoliberal governance (3-8) in which competition and the market are positioned as thoroughly ‘antinaturalist’ (7) (pace the “market naturalism” of laissez-faire liberalism), which is to say, requiring continuous and permanent production. Such production is instituted, to use a key example, through the incentivisation of permanent competition between subjects on the basis of inequalities between them, and therefore a division of subjects amongst themselves through a process of individualisation in which each is incentivised and governed to become ‘an entrepreneur who accepts the rule of the competitive game’ (20) (an individualisation that, for Lazzarato, the intermittents refused through networks of solidarity and strategies of refusal (45-46; 53)). The tightening reforms of the system of unemployment insurance were for Lazzarato designed to ‘maintain each individual in a position of differential inequality in relation to all others’ (10-11). These inequalities are entangled with affective elements: the fear and insecurity between and amongst individuals is a crucial element of neoliberal governance (16-17) up to a point that Lazzarato calls a tolerable equilibrium of precarity, in which techniques of minimum wage, minimum income, minimum retirement age, etc. (40-41) function as a threshold below which social peace is threatened (i.e. below which subjects will become politicised and risk is unacceptably heightened for governors and owners of capital). Neoliberalism operates through such ‘techniques of the minimum’ (40) combined with an aim for ‘precarious full activity’ (28), rather than full employment, in which ‘[e]veryone will have to work under whatever conditions’ (28). This chapter also develops some pertinent and incisive critiques of Foucault’s work on neoliberalism (23-33). Throughout, Lazzarato highlights the ambiguous role played by unions in the course of the struggle, who he saw as too often tied to a capitulative corporatist logic of professionalisation and an outdated and similarly capitulative logic of permanent employment (45; 112; 115). In chapter two, “The Dynamics of the Political Event: Micropolitics and the Process of Subjectification,” this theme of dissatisfaction is given more grounding as Lazzarato argues that contemporary capitalism can only be transformed through a departure from Marxist theory and practice. Rather, as mentioned above, it is in the work of Deleuze, Guattari and Foucault that more effective tools can be found; namely, those of micropolitics and microphysics which, for Lazzarato, ‘can be said to be the first great theories that have really problematized the neutralization of “revolutionary politics” and the “revolutionary subject” that capitalism has been carrying out since the Soviet revolution’ (83-84). There are three key points to mention on the case Lazzarato makes for this. First, and of course, he does not argue that the micropolitical dimension should take ultimate priority over the macropolitical, nor offer a naïve reading which suggests that there is an ‘exaltation of marginality’ (77) or of “the small.” Indeed, the passage through macropolitics is essential for Lazzarato (130). Second, Lazzarato argues in terms of micro- and macro-political strategies (which he contrasts with dialectics). Strategies at the molecular or micropolitical level, crucially, ‘participate in the struggle for a new subjectivity and the constitution of a new self’ (102) at the level of everyday life. Subjectivity being a key site of political struggle precisely insofar as contemporary neoliberalism functions in-part through its own micropolitical strategies which incentivise competition, division, fear, insecurity and individualistic entrepreneurialism as the homogenous way of life available to us. Strategies at the molar or macropolitical level operate through what Lazzarato calls (i) battles of acts (e.g. blockades and occupations) which, contrary to the contained (and containable) ‘demonstration-rally-demonstration ritual’ (113) of unions, the coordination offered different acts which escaped these old models; and (ii) battles of words, in which the discursive space is a site of political contestation, the key victory Lazzarato highlights here being the explicit addition of the term “precarious workers” and insertion into the public realm (114-117). The political is, for Lazzarato, heterogeneous and constituted by disparate, connected, but non-unified strategies; as such, ‘strategy must take the place previously occupied by dialectics’ (128) for effective political action. Third, Lazzarato buttresses his rejection of a Marxist framework through offering an approach to the concept of the event. Lazzarato’s (anti-idealist) notion of the event is marked by three temporalities: the context which formed its conditions, the new conditions (subjective and objective) it generates, and ‘the conditions to seize or construct in order to change the state of things and subjectivities’ (93). The event is contingent and open, and so, revolutionary political action must therefore be both experimentalist and constructivist in turn. The final chapter, “Economic and Subjective Impoverishment under Neoliberalism,” focuses predominantly on a reading of Marcel Duchamp’s notions of anart and the readymade both to offer a reading of the role the culture industry plays in today’s subjective impoverishment, but also to argue that Duchamp’s ability to operate at the border of art and non-art has politically transformative potential (in addition to its radical opening of the spaces of artistic production and consumption) (150-162). Mass expression – as the intermittent slogan “no culture without social rights” which Lazzarato continually cites – becomes fused with radical political action (and a defense against fascism) (176), in which there is an ‘impossibility of separating the political revolution from the revolution of the sensible, the macropolitical revolution from the micropolitical revolution, the political question from the ethical question’ (192). Ultimately, Lazzarato argues that political action which confronts the capitalism with which we are faced must concern itself with constructing a new ‘war machine’ (205) (in the Deleuzo-Guattarian sense) through a new political experimentalism which does not shun the strategies of times past, but recognises their limitations, expanding the field of experimentation to all those ‘assemblages of being-against and being-together, the assemblages of ruptures and sutures, the assemblages of techniques of not-being governed and governing oneself’ (205). A chain of connected, yet discontinuous and non-unified (138), revolutionary practices across the social field and across micro- and macro-political domains, becomes Lazzarato’s ambitious minimal condition for effective revolutionary transformations. Nonetheless, there are some aspects of EP which remain unconvincing, or which raise issues without fully exploring their grounds or implications. For one, there is Lazzarato’s limited engagement with the works of Badiou and Rancière, which are treated in the text as largely objects of dismissal rather than with sustained engagement. For example, Lazzarato argues that they ‘take refuge in universalism and formalism’ (85) rather than in felt, affective space of singularity and rupture, and that political action is less about ‘fidelity to the event’ (92) than it is about creation. This approach is replicated when Lazzarato targets what he calls the ‘Marxist tradition’ (76) as being reductive in its prioritisation of ‘only one strategic power relation (the relations of production) and only one revolutionary subject (the working class)’ (77). These arguments may well be convincing when fleshed out in detail, but remain at the level of general, rather than singular and specific, criticisms when developed in the manner Lazzarato pursues, and as such may well only convince those already amenable to these claims, and may seem themselves reductive to those who work in those traditions. Finally, while Lazzarato does insist on the necessary passage through the macropolitical of the construction of new forms of mutualism, sociality and autonomy, and of the difficult organisational work of micropolitical coordination (141), one question which is not fully explored here is that of macropolitical coordination. Following discontinuous (non-synthesisable) chains of singular revolutionary practices across domains and struggles, how and through what means might macropolitical coordinations be constructed in order to confront and transform the truly global character of contemporary capital? While this is, of course, not the central concern of EP, it is one of the key questions it raises. Overall, EP is an impressive and important text which would be of interest and use to anyone interested in work which seeks to bridge the putative theory-practice divide in the realm of politics, to those interested in the work of Deleuze, Guattari and Foucault, and to those interested in the changing nature of contemporary capitalism. 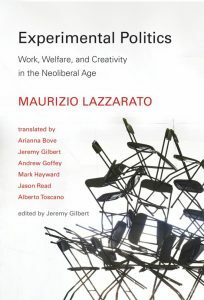 While much work has been done since this book’s original publication on our new capitalism of precarity, Lazzarato’s insights and arguments remain instructive, prescient and impressive in terms of some of the dynamics which he foresaw prior to the wholescale roll-out of the “age of austerity” and precarity. With Lazzarato, we can continue to think about what our revolutionary future, and the path we create along the way, could be. Email me when others comment on this review. You can also subscribe without commenting.